Will water supply concerns overshadow the 2008 Summer Olympics in Beijing? Over two million people are expected to visit Beijing this year for the Summer Olympic Games. In August, the population of the metropolis will crest 19 million souls. The arrival of so many visitors to China’s capital will result in exaggerated water use of 2.75 million cubic meters (2,229 acre-feet) a day or, in layman’s terms, enough water to fill 2000 Olympic size swimming pools each day. Chinese officials may soon begin to worry as North China is currently enduring a severe drought including Hebei (which surrounds Beijing) and other provinces in the north. The Chinese Ministry of Water Resources indicates the drought has caused 50,000 wells to go dry, with over 170,000 additional wells short of water. Over 3.4 million hectares of crops have been compromised, and 250,000 people are now short of drinking water in the Shandong, Heilongjiang and Hebei provinces. China’s answer to this Catch-22 is to pipe water to Beijing via extensive water supply canals, often at the expense of local citizens, businesses, or agricultural practices. China hurries to finish 309 km (192 miles) of canals to draw water from behind several dams in the province of Hebei to serve water to Beijing for the Olympics, as stated on Reuters. These canals are actually part of a larger project China is undertaking to pipe massive amounts of water from the Yangzte River in the south to arid regions in the north, widely known as the South-to-North Water Transfer Project (previously reviewed on WaterWired). 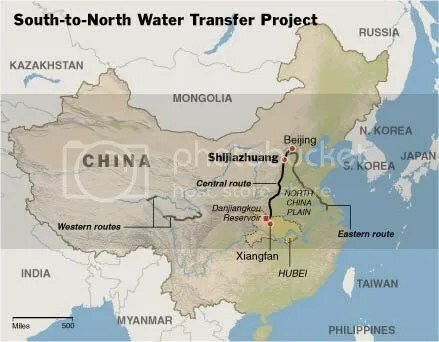 Central route of the South-to-North Water Transfer Project, courtesy of The New York Times. The world’s attention will soon be on Beijing, China for the Summer Olympic Games. Will the world’s attention also be on the many people currently affected by drought conditions and difficult times in North China? In China, the State Flood and Drought Relief Headquarters has just updated statistics showing currently 5.9 million people face drinking water shortages, more than double that figure of 2.43 million published on Feb. 24, throughout the entire country.